Next: The Best Classic Apple Pie Recipe – Dairy-Free! Previous: Chocolate Bourbon Pecan Pie Recipe – Dairy-Free! Looking for a last-minute hostess gift to bring to Thanksgiving today? Or, a FAB breakfast to serve to your guests tomorrow (the day after Thanksgiving and pre-black Friday shopping)?! Look no further!! 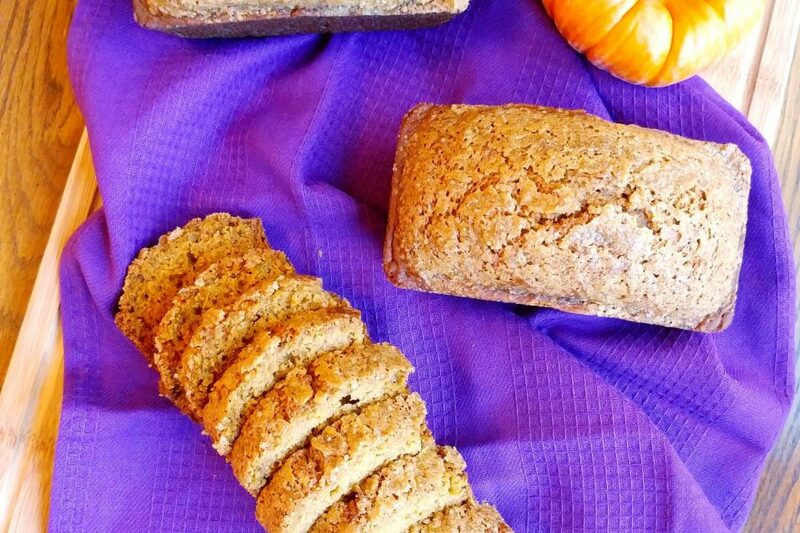 Dairy-free whole wheat pumpkin bread is HERE! It’s DELICIOUS!! 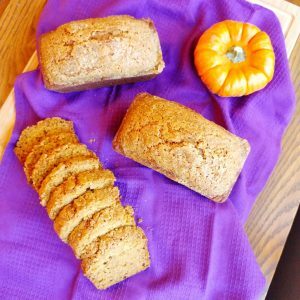 The pumpkin and Fall spices create an undeniably fabulous flavor. It’s healthy-ish. 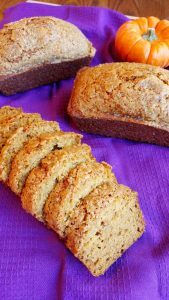 Whole wheat flour adds fiber, & applesauce replaces some of the oil. It’s QUICK & EASY yet impressive! You’ll feel delighted to share it with loved ones. I love quick breads. And I especially love mini quick breads!! They are so cute & perfect to bring to friends and family, or just the right size to serve for breakfast. And so, I made these mini pumpkin breads! One recipe makes 3 mini loaves. You could absolutely make it as one 9×5 inch pumpkin loaf if you’d prefer. I used coconut oil in place of butter to make the recipe dairy-free! This bread goes beautifully with coffee in the morning. It’s easy to grab-n-go, or to savor on a relaxing weekend. It’s also a tasty afternoon snack. I like to heat up a slice in the microwave for 15-30 seconds and slather on the almond butter or peanut butter :-D.
It’s. So. Good!! So satisfying. It’s not too sweet, but just sweet enough that it will curb a sweet-tooth when it strikes (trust me, I’m a dessert-after-every-meal gal).  This is a DELISH option that can be made in 1 bowl with a whisk and spatula. It comes together super quickly (30 minutes or less), cooks in the oven for about 45 minutes, and boom! Ready to enjoy warm. 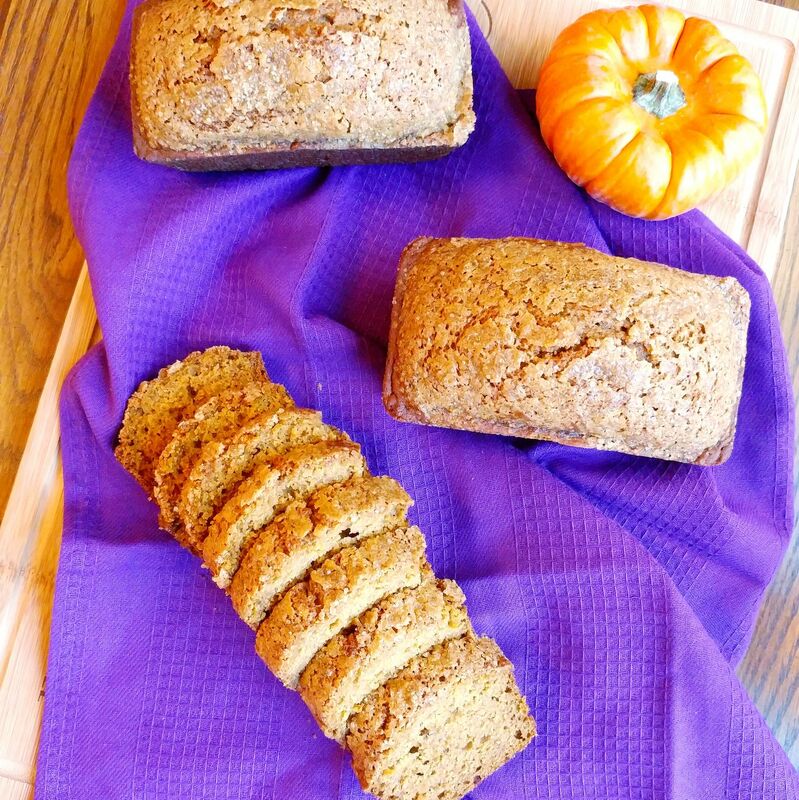 Whole Wheat Dairy-Free Mini Pumpkin Bread Loaves! 1) Preheat your oven to 350 degrees F. Spray 3 mini loaf pans with cooking spray. The mini pans I use are 5.75 inches x 3 inches. 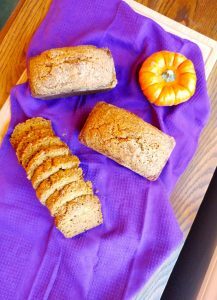 2) In a large bowl, whisk together the dry ingredients– all-purpose flour, whole wheat flour, granulated sugar, brown sugar, baking powder, baking soda, salt, cinnamon, & pumpkin pie spice. 3) Add in all the wet ingredients– the melted coconut oil, applesauce, vanilla, eggs, & pumpkin. Using a spatula, fold the ingredients together. Nice and gently. Until you have a beautiful, smooth pumpkin-colored batter. 4) Pour the batter into each of the prepared baking pans. Then, I’d put them onto a cookie sheet. That way, instead of having to put each one into the oven, and pull each one out of the oven (especially checking them). Instead, you just pull out the whole pan at once. 5) Bake the pans in the oven for 40-45 minutes, or until a tooth pick poked into the middle of one of the breads comes out clean. 6) Cool the breads in the pans for about 10 minutes. Then, turn them out onto a cooling rack. They also freeze well! Then just take one out of the freezer the night before you need it and it’ll be ready to eat/serve the next day.